The Institute for Research on Race & Public Policy (IRRPP) at the University of Illinois at Chicago (UIC) promotes and coordinates engaged research on racial and ethnic justice in the U.S. Our mission is to increase society’s understanding of the causes of racial and ethnic inequality and to provide the public, organizers, practitioners, and policymakers with research-based policy solutions. To fulfill that mission, IRRPP funds research on race and ethnicity, trains scholars to participate in policy discussions, collaborates on social justice projects with community organizations, and holds events exploring the link between policy and racial and ethnic injustice. 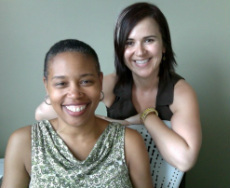 Francesca Gaiba and Michelle Boyd, co-founders of WriteOut! Francesca and Michelle met in a Salsa class in 2002 and took lessons together for several weeks before realizing they worked in different departments at the University of Illinois at Chicago. When both were Associate Directors at UIC's Institute for Research on Race & Public Policy, they dreamed up WriteOut! in the spring of 2012. Both of them understand the challenges that students face while working on their dissertations. And they're committed to supporting the next generation of race/ethnicity scholars by helping them improve their writing practice. WriteOut! is Francesca's brainchild ﻿﻿and when she was at IRRPP she was responsible for its smooth administration, including publicity, admission, fundraising, financial management, evaluation and web updates. Michelle is in love with writing and wants every other academic to fall in love with it too. Mich﻿﻿elle who now runs her own academic writing retreat (InkWell), co-developed the program with Francesca, suggested the daily coaching component, met and coached with retreat participants from 2012 to 2014, developed the writing resource guide, and designed the website.